When you’re traveling, every ounce of extra weight in your bag can make a difference. Weight limits and baggage charges can turn your trip planning into a logistical nightmare. Do you sacrifice your favorite pair of pumps or risk getting a cold without your bulky sweater? If you’re the type who has to sit on your suitcase to zip it up, then a travel-sized hair dryer might help you pack for your next trip. There’s no need to sacrifice style when you travel with these compact, yet powerful little tools. You can look perfectly polished on your next vacation with a travel blow dryer. Confidently pack your suitcase with one of the 7 best travel hair dryers reviewed here. We compare the best-rated, compact hair dryers on the market to help you decide which one to take with you on your next trip. The Revlon Compact Hair Dryer is the top choice here at The Right Hairstyles. With 527 Amazon reviews and over 70% of those at 5-stars, this compact, powerful little dryer is very popular with consumers. Weighing in at only 1.2 pounds, this small but powerful dryer fits nicely into a gym bag or duffel bag for a weekend away. It measures 3.4 x 9.4 x 7.2 inches and features 2 heat/speed settings, a cold shot button, a removable concentrator nozzle, and protective anti-slip bumpers for a better grip. The end cap is removable for easy cleaning, and it also has a hanging ring for easy storage. 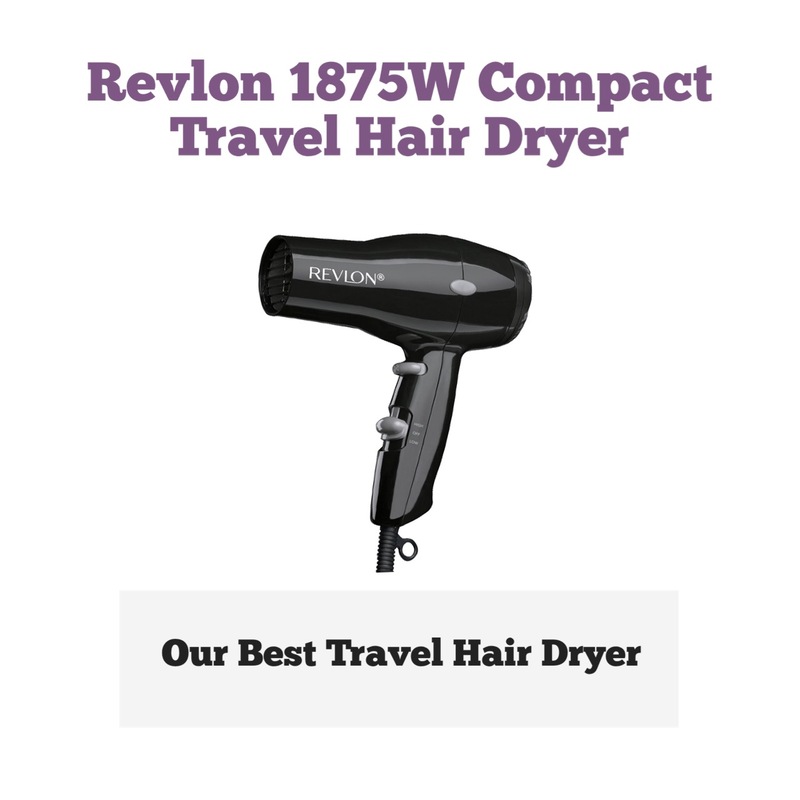 This Revlon Compact Travel Hair Dryer is a very inexpensive option that is perfect for traveling, the gym, and even for the guest room in your house. With 1875 watts of hair-drying heat, the Conair Vagabond dries hair fast! Perfect when on the run or at the gym. This compact dryer weighs 1.2 pounds and measures 5 x 9.2 x 3.5 inches, barely taking up space in your bag. Featuring a cool shot button with an ergonomic, foldable handle, and a professional-length cord, this dryer is also dual voltage for international travel. With 2 heat/speed settings, it’s easy to customize your hair drying experience. A common issue reported by consumers is that hair gets trapped in the fan at the back of the unit, so make sure to hold the unit away from hair when drying. The Conair Vagabond is good for international travel thanks to its dual voltage feature, and it won’t weigh your bag down. The foldable handle makes it even easier to pack neatly into your suitcase. The mini turbo Conair Compact Hair Dryer with folding handle has enough power to keep you styled on-the-go. With dual voltage, travel destinations are limitless. This small hair dryer weighs merely 1 pound and measures 3 x 4.2 x 7.6 inches. The folding handle makes it great for small bathroom spaces, and compact enough for your suitcase. The cool shot button has a convenient on/off feature so you don’t have to hold down the button for continuous cool air. As with most compact models, there are 2 heat/speed settings. This mini turbo Conair Compact Hair Dryer barely takes up space in your bag. Take it with you on your next trip overseas thanks to the dual voltage feature. The BaBylissPRO Tourmaline Titanium Travel Dryer, from BaByliss, a world leader in professional styling tools, takes up little more space in your bag than a can of soup. Check out the Amazon customer review with the pictures to prove it! This cute, compact dryer weighs only 10.5 ounces, the lightest of all the portable dryers reviewed here, and measures 5.5 x 2.5 x 8.9 inches. It features a folding handle, a concentrator nozzle, a convenient hanging loop, and an extra-long, 5-foot cord. According to a reviewer, they tried to use the 3-year warranty as stated on Amazon, however, they were told by the manufacturer that the warranty is only for 1 year. This is standard for most products, so just be aware of the issue. Take the BaBylissPRO Tourmaline Travel Dryer with you on your next trip to the gym, or overseas. It may be small, but this powerful little dryer can deliver style and have you looking your best wherever your travel dreams take you. The Wazor hair dryer is a must-have if you are traveling with kids. This compact dryer gives you total styling control for sensitive scalps and lots of safety features. At 1000 Watts of power, this mini blow dryer is safe to use on children’s sensitive heads, and the double safety net over the fan keeps hair from getting sucked in and tangled in the dryer. You can choose your temperature setting between low and high, and deliver cool air to set your style with the cool shot button. The lightweight dryer includes a removable lint filter, a concentrator cap, a 70-inch power cord, and a DC motor that is quieter than other mini dryer models. The Wazor weighs in at only 12 ounces, and measures 4.7 x 2.4 x 5.7 inches. When traveling with children, we know that packing can get complicated. Why not simplify things with this Wazor Mini Travel Dryer? At half the size of a regular dryer, with lots of power for styling, it would be one less thing to worry about packing on your next trip. European company, Andis, began almost 80 years ago and today their products are available in 90 countries around the world. Andis produces clippers, trimmers, dryers, blades, curling irons, and flat irons that are used and trusted by stylists everywhere. The Andis Fold-N-Go ionic hair dryer features ionic technology to reduce frizziness while conditioning hair. It dries hair faster by breaking up water molecules and sealing the hair cuticle. It also has 3 heat and air settings, a cool shot button, and a folding handle. At 1.6 pounds, it is a little heavier than other travel dryers reviewed here, but the retractable power cord makes for quick, convenient, and mess-free storage. The dryer measures 4.1 x 8.1 x 6.1 inches, compact enough for your next trip. The Andis 1875 Watt Fold-N-Go Ionic Hair Dryer will deliver high power and style for your next vacation. The retractable cord makes packing and storing a breeze, and the ionic technology will give you soft, smooth, shiny hair no matter where you are. With over 15 years of experience, JINRI uses industry-leading technology in their products. The JINRI hair dryer features ionic ceramic technology that quickly dissipates water molecules and uses negative ions to seal and smooth the cuticle. Hair is silky, smooth, and shiny. This compact dryer weighs only 11.2 ounces and measures 8 x 2 x 5 inches. It features a unique, ultra-quiet DC 1000 Watt motor with an anti-overheating mechanism, a concentrator cap, and a 6-foot swivel power cord for easy styling. This compact and durable JINRI Mini Dryer will give you frizz-free, silky, manageable hair when you’re on-the-go. Take it with you on your next vacation or pack it in your gym bag. With so many options to choose from, we hope that the answers to common questions below will help you choose the best travel hair dryer for your next trip. An ion is a small particle that can be positively or negatively charged. 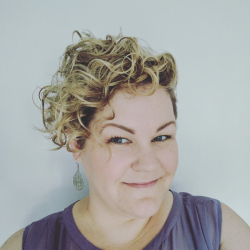 Negative and positive-charged areas already exist on your hair. The water in wet hair is positively charged, and ionic dryers emit negative ions. The negative ions cause the water molecules to break up and evaporate faster, resulting in faster drying time and less heat-damage to hair. Some products have ceramic or tourmaline parts that help heat up the air faster and also add to a faster drying time. How Big Is a Travel Hair Dryer? Travel hair dryers come in a range of sizes, however, they are usually about half the size of a regular dryer and they weigh in at around 1 pound. How Long Do Travel Hair Dryers Last? Don’t let it get too hot: overheating is the major cause of dryers failing. Dry your hair at a lower temperature. Ensure you are using the right adaptor when traveling. Keep the vent screen clean from lint and dust. Go, travel with confidence and convenience with a travel hair dryer! Whether you are taking an overnight trip or a long-awaited vacation, you want to pack efficiently and lightly. That’s no problem with today’s wide range of travel-sized blow dryers on the market. Take style and convenience with you no matter where in the world you wake up next. Whether at the pool, the gym, the hotel, or in-transit, a mini dryer is the last thing you have to worry about.